Democratic Sen. Bob Menendez's (N.J.) lengthy corruption trial ended Thursday in a mistrial after the jury deadlocked on all charges. The jury announced in a note before lunch Thursday that it could not reach a unanimous decision, the Washington Post reports, "nor are we willing to move away from our strong convictions." "They are telling us in the clearest terms possible that they have done their job as diligent jurors. I think we have a real hung jury,’’ said Lowell. 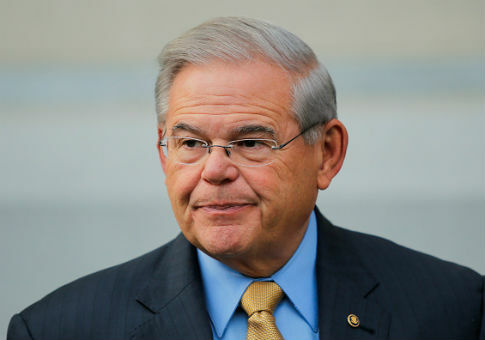 Prosecutors argued Menendez took bribes and gifts from Melgen in exchange for his assistance with such matters getting his girlfriends visas and helping out with a Medicare dispute. Melgen, a Florida doctor, is already awaiting sentencing on a previous conviction for defrauding Medicare. A 2016 Supreme Court case clearing corruption charges against former Gov. Bob McDonnell (R., Va.) has raised the standard for convicting public officials of corruption. This entry was posted in Politics and tagged Bob Menendez, Corruption, Salomon Melgen. Bookmark the permalink.